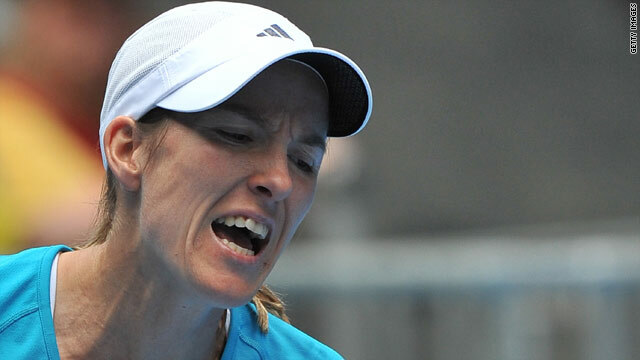 Justine Henin had a real battle before getting past compatriot Yanina Wickmayer. (CNN) -- Former world number one Justine Henin won an all-Belgian clash with Yanina Wickmayer to reach the quarterfinals of the Australian Open on a day in which second and third seeds Dinara Safina and Svetlana Kuznetsova fell by the wayside. Henin was tested to the limit by last year's surprise U.S. Open semifinalist Wickmayer before going through 7-6 1-6 6-3 but her two Russian rivals were not so fortunate. Second seed Safina, beaten in last year's final by Serena Williams, suffered a worrying recurrence of an old back injury as she retired trailing 4-5 in the first set to compatriot Maria Kirilenko. Earlier on Sunday, Kuznetsova was overpowered by fellow Russian Nadia Petrova, who won 6-3 3-6 6-1, having routed Kim Clijsters in the third round. Meanwhile, Zheng Jie became the first Chinese player to make the last eight of the Australian Open by beating Ukraine's Alona Bondarenko 7-6 6-4. Henin, in the second tournament of her comeback, savored her hard fought triumph against the dangerous Wickmayer, who looked favorite after sweeping through the second set. But the greater experience of 27-year-old Henin proved the difference in the decider. "It's, yeah, magical out there the way I feel," Henin told reporters. "I feel so happy on the court -- I feel it's my place." But she faces an awesome task in the quarters against Petrova, who is in the form of her life, claiming the decider against French Open champion Kuznetsova with a run of six straight games after being broken in the opening game. Zheng will face unseeded Kirilenko, who put out former champion Maria Sharapova in the first round.